New research suggests prolonged hours sitting can contribute to non-alcoholic fatty liver disease (NAFLD) among middle-aged Koreans. Numerous studies have come out supporting the fact that sitting for long periods of time, or living a sedentary life, can contribute to many negative health effects. 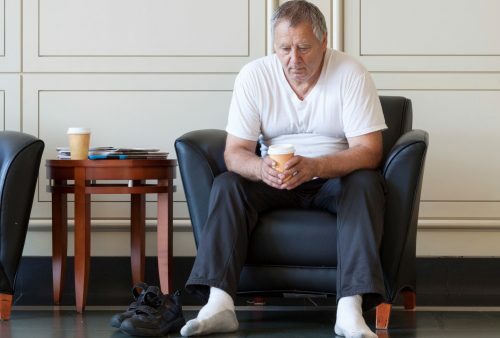 Sitting and chronic disease have largely been studied as of late, linking prolonged sitting to obesity, diabetes, insulin resistance, metabolic syndrome, cardiovascular disease, cancer and even early death. This link was still evident in individuals who participated in vigorous physical activity, revealing that even intense exercise cannot fully protect us from the negative effects of sitting. In the latest findings researchers aimed to explore the link between sitting, physical activity and non-alcoholic fatty liver disease. They studied records of nearly 140,000 Korean men and women who had medical examines during March, 2011, and December, 2013. Physical activity and sitting were documented using questionnaires, and fatty liver was determined using ultrasonography. From the group, nearly 40,000 had a fatty liver. Sitting and a decrease in physical activity were independently associated with an increase of non-alcoholic fatty liver disease. Furthermore, these findings were seen in individuals with a healthy body mass index (BMI) less than 23. Lead investigator Seungho Ryu said, “We found that prolonged sitting time and decreased physical activity level were positively associated with the prevalence of NAFLD in a large sample of middle-aged Koreans.” An effective means to combat non-alcoholic fatty liver disease in those who sit for prolonged periods of time are to increase physical activity levels of individuals and minimize the time spent sitting. The findings were published in the Journal of Hepatology. We are all sitting too much, but sitting for long periods of time is even worse in older adults. Whether we’re stuck in traffic or in front of the TV, the main message is that we need to get up and start moving more if we want to protect our livers – and our health in general. Stand on public transit, like a train or bus. Take the stairs when available as opposed to an elevator. Set a reminder to get up every 30 minutes. Switch-up working in a seated position to a standing one. Stand or walk around when using the phone. Take a walking break after or with your coffee break. Walk to a co-workers desk instead of e-mailing or calling them. Swap out TV time for activity time. In seniors who are over 65 it is estimated they spend over 10 hours a day sitting. The main reasons for this are dwindling health and limited abilities. But even still it’s important to get moving throughout the day. Here are some tips for those over the age of 65 to minimize sitting time. Avoid long periods in front of the TV or computer. Stand up or move during commercials. Stand or walk while on the phone. Use stairs as much as possible. Take up active hobbies like gardening. Do the majority of housework, if possible. Pressing: While on your back feel for your liver while pressing your fingers up and under your ribs gently on the right side of your body. In this position you can gently press your liver. Start with 20 presses and move your way up to 100. Press and rub: To complete this you will have to lay on your right side and place your left hand over the area of your liver. Position yourself in a fetal position with an inclined neck and bent knees. Press on your liver with your fingers or knuckles to give it a massage. Striking: By applying a light thumping on your liver you can promote better liver health. Lay on your left side and lightly, but rapidly, strike your liver. Trunk turning: Sit upright with legs crossed with palms on belly. Turn your trunk to the left and right at least 15 times each. Start gently, but if permitted health wise use more force. Return to a centered position with fingers interlocked and push palms forward eight times. Not sitting is the easiest way we can begin to improve our health. So become more mindful and conscience of your sedentary habits in order to prevent long hours sitting and to keep your liver healthy.